In action in Hamburg: the HOPLIT F 1200 H titanium helmets by ULBRICHTS Protection. Schwanenstadt (Austria) / Hamburg – ULBRICHTS Protection supplies ballistic titanium helmets to the police of the Free and Hanseatic City of Hamburg. After careful market research, the decision was made for a helmet made of titanium, which was developed and manufactured by the Austrian specialist ULBRICHTS Protection. The helmet which now bears the name HOPLIT F 1200 H is one of the most powerful protective helmets and offers a protected area of 1.200 square centimeters. 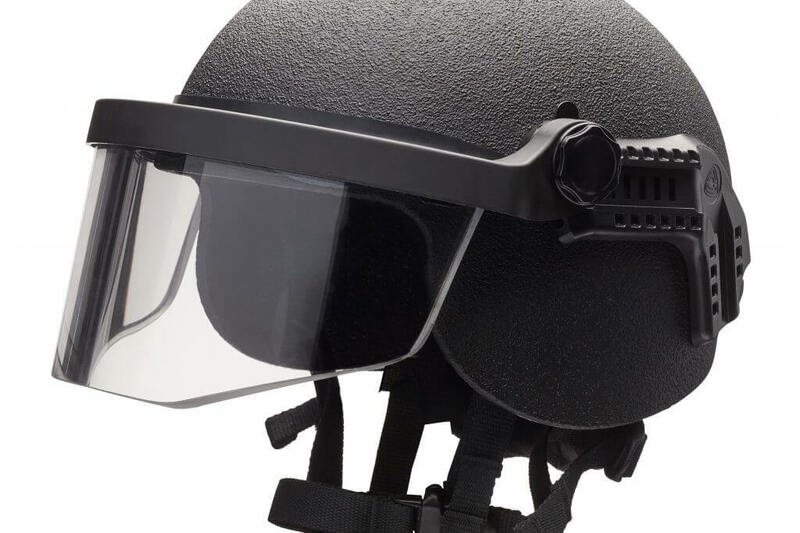 It also has visor adapters that allow police officers to remove or replace a visor in seconds – depending on the specific operating requirement. Due to the satisfaction with the helmet system, another order was placed even before the delivery of the first order was completed and will be supplied later this year. In the future, the crews of the Hanseatic city’s patrol cars will each have two ballistic protective helmets at their disposal. The evidence and arrest units now also receive this sophisticated and at the same time innovative head protection. It completes the officers’ personal protective equipment, which also consists of new protective vests and assault rifles. Those responsible have taken the initiative to provide the right equipment and upgrade gear where possible in response to the heightened threat posed by international terrorism. The HOPLIT was specially developed to meet the requirements of patrolmen. It offers the same level of protection as the titanium helmets used by special task forces, but with a weight of just 1.600 grams (without a visor) it is significantly lighter. Titanium helmets are used by all German special forces and – in the shape of the HOPLIT series –by patrol police in more and more German federal states, including Baden-Wuerttemberg and Hesse. Hamburg is now following on. In addition, ULBRICHTS Protection has already received orders from four other federal states and more federal states are specifically considering procurement at the moment. Shortly after an emergency call, it is usually patrolmen who are the first to arrive on the scene as first responders. Many scenarios, in particular people running amok or terrorist situations, mean there is no time to wait for colleagues from the special task forces. New operational concepts therefore envisage immediate intervention. A major threat emanates from projectiles that are fired at close range. This applies both to anti-terrorist operations and to the much more frequent use of firearms where terrorism is not involved, such as robberies. By virtue of their material, titanium helmets offer the most effective protection against direct bullet fire, for example from submachine guns. In addition, titanium optimally absorbs the residual energy which is transferred when a projectile is stopped and thus prevents the helmet wearer from being seriously or fatally injured by the helmet’s deformation. ULBRICHTS titanium helmets are fully certified according to the “Technische Richtlinie (TR) – Gesamtsystem Ballistischer Schutzhelm 05/2010”. The guideline drawn up by the experts at the Police Technology Institute (PTI) also takes into account in particular the measurement of this deformation, which is therefore becoming more and more important internationally. In addition, the HOPLIT provides protection against explosions, splinters, bites and punches, as well as heat and chemicals. 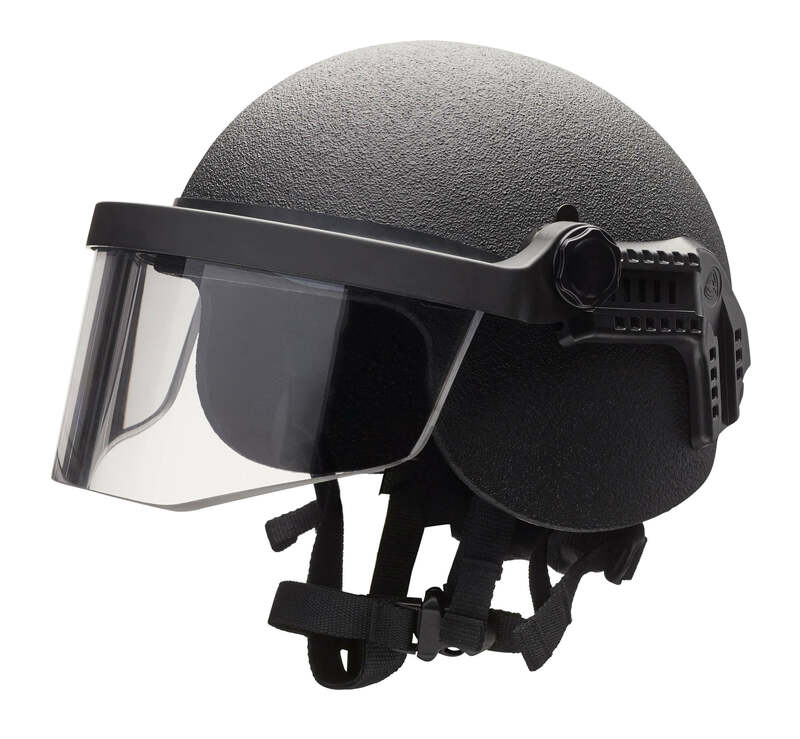 The helmet interior is adjustable by means of a bullet-proof rotary knob and as a first-response helmet can therefore be adjusted to different head sizes by changing users in just a few seconds. All HOPLIT models are optionally available as a hybrid titanium-aramid composite for even better splinter protection, as well as with a ballistic visor. ULBRICHTS Protection from Schwanenstadt (Austria), a division of ULBRICHTS Witwe GmbH, manufactures ballistic helmets made of titanium and titanium aramid (hybrid). The company’s international clientele includes special forces, police units and military personnel. ULBRICHTS Protection began specialising in the ballistic protection of police forces more than 20 years ago and uses titanium in particular. Decades of research and development, various patents and special manufacturing processes form the basis for the innovative strength of ULBRICHTS Protection in the field of head protection against bullets and ballistic projectiles. In this field the Austrian company is the market leader in Central Europe.